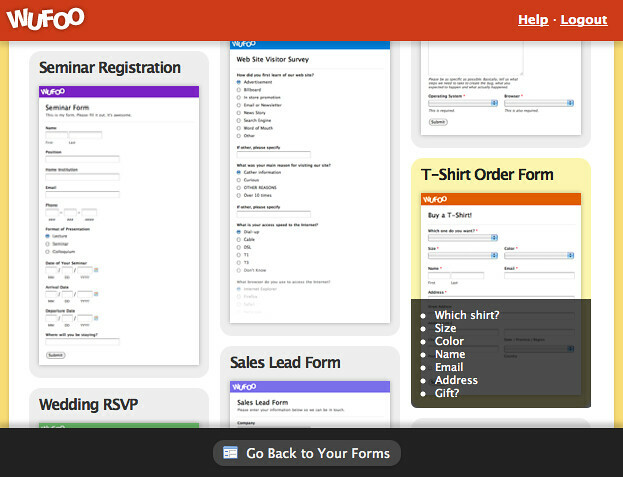 Integrating Wufoo forms into your web application is easier than ever for developers with the Form Embed Kit. Greetings friendly Wufoo fans! We've been hard at work on a project for our fellow Wufoo developers called the Wufoo Form Embed Kit. While the kit is targeted primarily at developers (yeah, we're about to nerd it up in here) the rest of you should be delighted to know that it's aimed at making it much easier to have your favorite web apps add Wufoo integration to their software. But you don't have to take my word for it, here's Chris Coyier with a little video rundown on what this product is all about. One thing to note is that while the example lives on Wufoo.com, which makes iframe communication a lot easier, this kit does work easily on any domain. Be sure to check out the demo in the video above and our developer documentation to see how it's as easy as copy and paste to make it all just work. 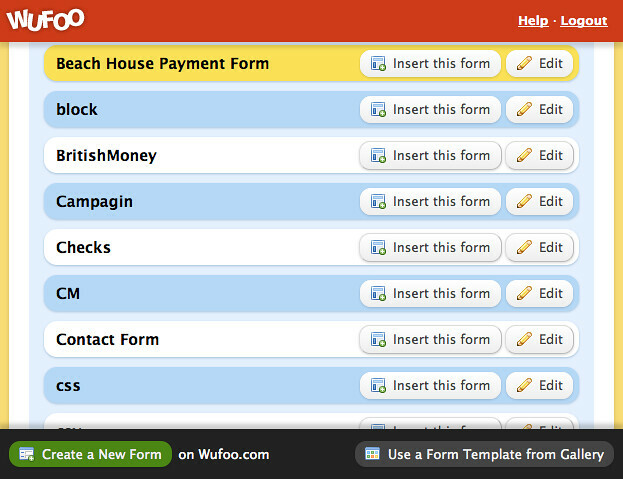 The following sections show off the important screens that are part of the Wufoo Form Embed Kit experience. No need to use the Login API to get your user's API key. 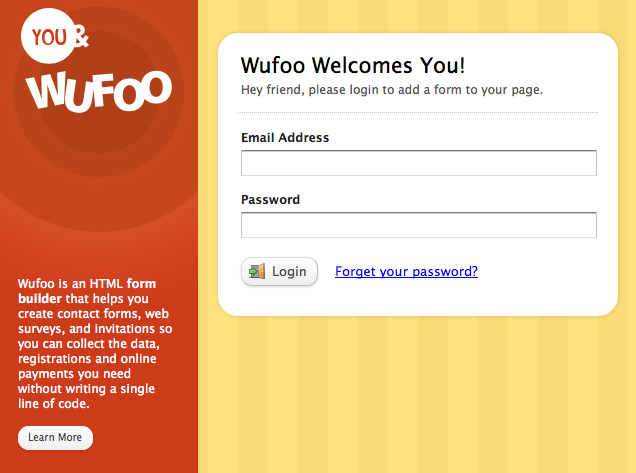 With the Wufoo Form Embed Kit, your users will log in using their normal username and password. Look ma, no API Keys! After login, the user can choose from their existing forms. If they choose "Insert", you're magically passed back the embed snippet to your page. This flow is similar to what your users would normally have to do with the Code Manager, but without error-prone copy and pasting and dealing with strange and unfamiliar code. If your users need a form that they haven't created yet in Wufoo, this kit also gives them the ability to quickly use some of the most popular templates from our Form Gallery. With a single click, they can add a new form right from your app without having to go to Wufoo proper. What's also nice about using a template from the kit is that an email notification is automatically set up for the user so that the form is useful right from the get go. With the press of a button, your user is whisked away to their Wufoo account (they won't need to log in again) to take care of maintenance tasks like creating or editing existing forms. "Oh no, they leave my app?!" Yep they do momentarily, we need the extra room to have an excellent form building experience. But don't worry, when the user is done saving their new form or edits, they are reminded to return to your app from our Form Builder. Peep the scene below. What can you build with this? You can create a Wufoo integration with minimal effort: no need to learn our APIs or do custom design and programming work. It eliminates user confusion and copy and pasting errors which can happen when you're going back and forth between applications with snippets. Increases engagement with your app - your users never need to leave your website to come and use our snippets! Need more? Download our Integration PDF for more reasons on whay our new Wufoo Form Embed Kit is the cat's pajamas. It'll also help you pitch the idea to your dev team!